Home Benefit Cosmetics BENEFIT COSMETICS They're Real! 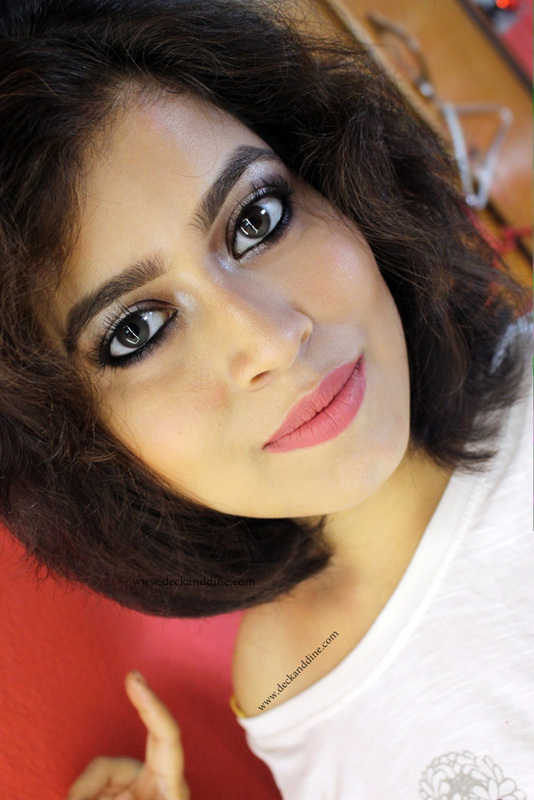 Mascara best mascara in india blackest mascara eyes mascara review They're Real mascara review Review of BENEFIT COSMETICS They're Real! Mascara. Worth the hype? Worth buying? Review of BENEFIT COSMETICS They're Real! Mascara. Worth the hype? Worth buying? Today I am going to talk about a raved product from the beauty industry. It is BENEFIT COSMETICS They're Real! Mascara. This is one of Benefit Cosmetic's best selling mascaras and it is called ‘real’ because it creates an illusion of fake eyelashes but they are actually real. I have waited years to try this. All the hype and positive reviews made this hit the number 1 rank on my wish list. So lets see if I am happy with this mascara or not. They're real! Lengthens, curls, volumizes, lifts & separates. Our jet black, long-wearing formula won’t smudge or dry out. A specially designed brush reveals lashes you never knew you had! Drooling. It comes in a classy looking chrome tube. The brush is very unique too. The outer black cover has all the other details. It is jet black which I am really fond of. 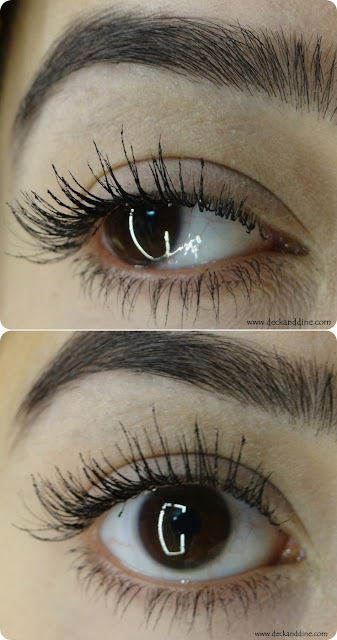 My lashes are brown and this black gives definition and makes them stand out. My lashes look curlier, longer and thicker with a single coat. The consistency is pretty good, more on the wetter side, just the way I like. I wore this for 9 hours at a stretch, and I didn’t face any smudging or flaking problems. The formula is semi-waterproof, so it washes off easily with regular cleansers. No need to soak your lashes in cleanser or oil at the end of day, no need of rubbing and harming your lashes. I also like the unique brush, it has custom-domed tip and the precision bristles that make it easy to coat each lash evenly from root to tip. This mascara is good for your first coat. But when I try to apply a second coat, my lashes stick together and it becomes too hard to separate. I have followed their instruction as well: applying horizontally & wiggling brush from side to side, base to tip and then vertically stroking upward. It crazily clumped my lashes. The brush takes out a lot more product that what you need. Moreover, I don’t feel comfortable wearing this mascara during daytime, it adds way too much drama. (which I love during evening). 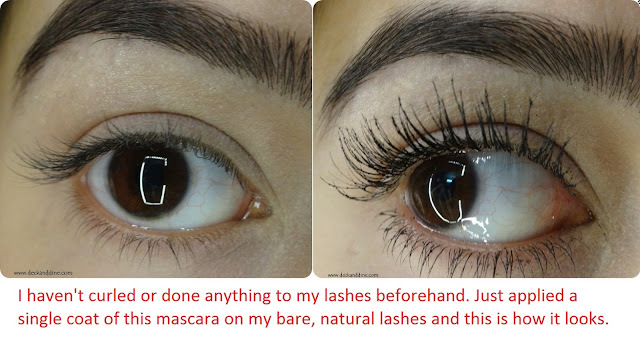 My lashes looked curlier, longer and thicker in seconds. Creamy consistency, more on the wetter side. Brush has bristles all the way around the tip which is perfect for doing your bottom lashes and getting in the corners where the lashes are smaller. Stays intact until you remove it with cleanser. No smudging or flaking issues. Can be removed without much effort. Well I wouldn't say I am disappointed with this as it gives amazing volume, length, curl, anything you could want in your mascara. But the only problem is, it clumps galore. To avoid it, you have to be really patient. Thus It is definitely not one to use on the go or if you're in a rush. But if you wear it properly, you will love the drama. I love it when it doesn't create spider legs, absolutely breathtaking. Claim Tick and Rating:-4/5Here’s to bigger, bolder, sexier lashes! I really want to hear your thoughts? Have you tried this mascara? Let me know.